Abstract OY VEY! 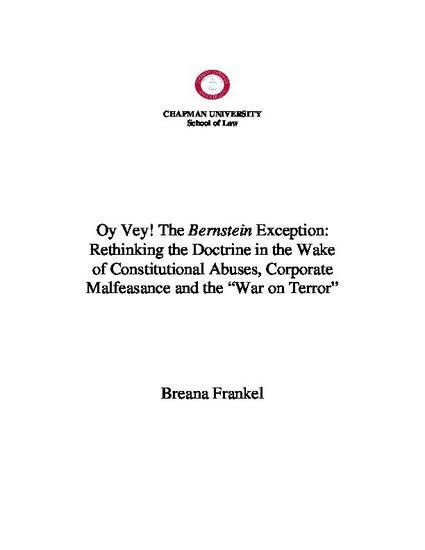 THE BERNSTEIN EXCEPTION: RETHINKING THE DOCTRINE IN THE WAKE OF CONSTITUTIONAL ABUSES, CORPORATE MALFEASANCE AND THE “WAR ON TERROR” Breana Frankel, Assistant Professor, Chapman University School of Law The “Bernstein doctrine” is a classic example of the exception swallowing the rule. The Bernstein exception allows the Executive to intercede in act of state cases when it determines that adjudication would not harm U.S.-foreign relations. The Exception was initially intended solely to permit victims of Nazi war crimes to recover in United States courts.  However, in the more than 50 years since its inception, the Bernstein doctrine has expanded far beyond its original intended purpose, and as a result, has created a host of constitutional and political dilemmas. The Bernstein exception violates the separation of powers doctrine by giving the Executive, through the State Department, unchecked power to determine the outcome of act of state cases brought in United States courts. This power has in turn been used by the Bush Administration to intercede on behalf of powerful, multi-national corporations in suits brought by individual plaintiffs, who are often the victims of international human rights abuses at the hands of these politically-connected corporations. Moreover, the Bernstein exception is another means by which the current Administration can further unconstitutionally expand its power in the purported “war on terror.” The Executive has succeeded in having cases dismissed simply by making an unsubstantiated observation that adjudication in a U.S. court might have a negative effect on the particular foreign government’s continued cooperation in the “war on terror.” Consequently, this article argues that the Bernstein exception should be abolished. The judiciary is quite capable of determining the applicability of the act of state doctrine without intervention by the Executive. While the Executive’s views regarding the impact of a particular case on U.S.-foreign relations may well be informative, its opinion cannot be dispositive.